While there are many wine bars in Vienna, there are surely none quite as cozy and welcoming as Weinbar Schwirtz. 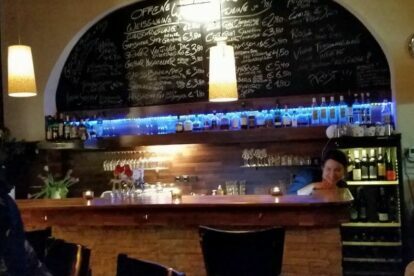 Opposite the Volksoper in the 9th district, Schwirtz has a solid array of Austrian wines and excellent company to offer. If there was a place to be a local (Stammgast), this is it. The bar itself has very little space, only a couple tables and a small patio set-up (in warmer months), but because the crowd mostly moves on to see a musical at the Volksoper, there is usually a spot free after a short wait. And this is where the Volkoper guests are missing out, because Schwirtz really shines in friendly local pride. The owners, Andreas and Monica Schwirtz, are often found nearby and are extremely welcoming. They have decorated the bar with a distinct personal touch, including a wild painting of their family depicted as characters in the Last Supper. And they make you feel like a part of the story as soon as you walk in. While I will admit a certain amount of bias, living in the 9th as I do, there is nothing like finding the place around the corner that exudes local spirit. Schwirtz has that in spades.